Howard Hughes, not the late billionaire aircraft tycoon, but Howard Hughes the long-time professional bass tournament fisherman, has some good advice for you. 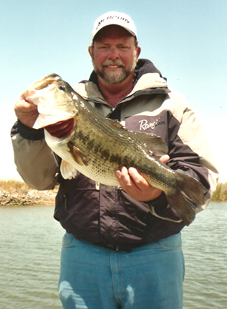 Hughes has been fishing bass tournaments for over two decades and at 60 years of age has been down that tournament trail long enough to know what preparation it takes to get ready for a pro level event. The very first thing Hughes does is acquire the schedules of the various organizations as early as possible and mark the dates on a calendar of the tournaments he would be interested in fishing. He then plugs in the various shows and sponsor obligations to check for conflicting dates. "After the schedule is set, I don't like to race around the week before a tournament and find all the rooms or campsites are taken, when you should be focused on the toumament," he said. It's time to start making room and camping reservations for the entire year in December or January. Hughes has a camper and if it is applicable, he stays in the campgrounds. In many towns and cities, however, there are only a few good campsites with enough hookups. "When the lodging is taken care of, now it's time to start thinking about a game plan," he said. " Shasta in January - jigs, dart heads, Senkos, spotted bass, Mothers Finest 6-inch worms, Rod Strainer Jigs, Iovino 4-inch Fat Boys. When you start thinking the WON BASS Delta in April - it's Iovino 6 inch Spades, Berkley Bungee Power Hogs, Senkos and crank baits." As he gets closer to the tournaments, Hughes starts checking the boat for water levels in the batteries, appropriate outboard oil in the boat and extra oil in his camper for extended stays. He tightens nuts and bolts and inventories his Rubbermaid Action Packer containers with the baits for that particular lake. However, he does not carry all the tackle for all the different lakes in his boat at one time. "Rod selection is next on the preparation list," said Hughes. "If I'm fishing Shasta, I will put the 7 foot Fenwick medium spinning action rods in the boat; and if I'm fishing Clear Lake, I'm using my fenwick MHs and HMG heavy rods and Flipp'n Sticks. "Fishing line selection is always changing dramatically with conditions and different lakes you are fishing," he said. "I fish BERKLEY products and when fishing Shasta I'm using 6-pound Transition, 8-pound XL, and 12-pound Sensation. When I move to Clear Lake and the Delta, I change to 10-Transition. 15- and 20-pound Big Game, and 20 pound Fire Line." Hughes likes to get one day on the water with his fishing line before a tournament, it takes the stretch out and has fewer tendencies to loop during the day. He also likes to troll his line (no terminal tackle) behind the boat before in order to take out the line twist. Setting up your reels is crucial and Hughes likes the Cardinal 772 and 774 reels with the center lock drag system. He also carries extra spools for all his reels that are spooled at home before a tournament, not in the hotel when he is tired and may not be as careful. with extra spools of line, if line get twisted or starts looping during the competition, you can make a quick change on the water and get right back into the action. Cardinal 774 reels are big spinning reels that can be used on the Delta an Clear Lake for drop-shooting in the middle of tule clumps or to make easier pitches under docks or tight areas with heavy line. "I kept a detailed log for 23 years on patterns that were working, number of fish caught, and I discovered you couldn't count on this log because weather and water level put a whole new cycle on things," said Hughes. "However, it does give you a starting point and some of the winning patterns you've seen over the years." Water level is one of the most important conditions Hughes considers when putting a pattern plan together. You can get the water levels and flow in and out of the lakes on http://www.westernbass.com every hour. this will tell you how far up the river arms you can go, where the cold water will likely be, and the current speed in the river arms. also check for the past levels of the lake and how much the lake has fluctuated. Tide tables and flow conditions are crucial on the Delta. On high flow there will be a lot of mud moving down the river that changes the water clarity. If it's a cold year, it will slow down the weed growth and if it's a warm winter the weed growth will choke out many of the areas you want to fish. Tides are the primary key to catching fish on the Delta, so make sure you have a tide chart. "Sharing information is sacred among bass fishermen," said Hughes, "You must protect the info when you get it, "Loose lips sink ships." I made a few mistakes in my career by passing on information and one would be surprised on how quickly the sources dried up. I've seen friendships end when your friend shows up on your starting spot and everyone in the tournament is throwing your favorite lure," be advised. When pre-fishing a reservoir, I like to run up the rivers to where the temperature and the water color changes and then work my way back, " said Hughes. When you do this it helps eliminate the colder water and when you find the break in the temperature you will start working your way back until you find groups of fish, small fish and larger fish schooled up. These groups of fish will move up and down with the current and may move a long way in the river arm. When pre-fishing the main body of the lake, fish primarily move up and down and don't move far from where you found them." Hughes talked about how important his Lowrance electronics have been for locating fish, both in pre-fishing and fishing the tournaments. "It's easy to see where the trout are, they are in the colder water, and when you find actively feeding bass you can see the shooting streaks going through the bait on the screen. It builds your confidence that you are in an area where fish are feeding," he said. Electronics are also important when fishing structure and looking for the outside bends in the creek channels. The outside bends are usually the deeper water and when Hughes is fishing creek channels he will speed up to get to the next outside bend in the channel. His meter will also tell him when transitions are happening below the water and helps him locate ledges and dropoffs. "Once I have found fish in pre-fish, I never go back to that spot. I don't beat my fish up," said Hughes. "Even if I have found those fish 3 weeks prior to the tournament, I don't bend hooks or anything like that, I leave the fish alone until tournament day. "The last day off pre-fishing before a tournament, I quit fishing early, retie my baits and sharpen hooks on the water, then drag my spinning reel lines behind the boat to take out the stretch and line twist," said Hughes. "Off the water early, I then go back to the hotel, take a shower and then put on a clean tournament shirt so I look good for my sponsors. So many anglers today do not represent their sponsors in a professional manner." Before the draw, Hughes likes to catch dinner and stay away from spicy foods. After the draw, Hughes is in bed early, not drinking and partying, or re-tying rods or re-spooling line, he's getting his rest so he's sharp for day one of the tournament. Howard Hughes is a true professional and the 2006 season has reflected his professionalism by winning this year's Bassmasters Open on Lake Shasta, and finishing in 3rd place on the first 2006 WON BASS Tour event at Lake Shasta.